This post is a dive into the stories of the clocks described in the book Longitude by Dava Sobel. I previously posted a book review of that book, so to skip the fun information on the clocks and go straight to the book review, go here. 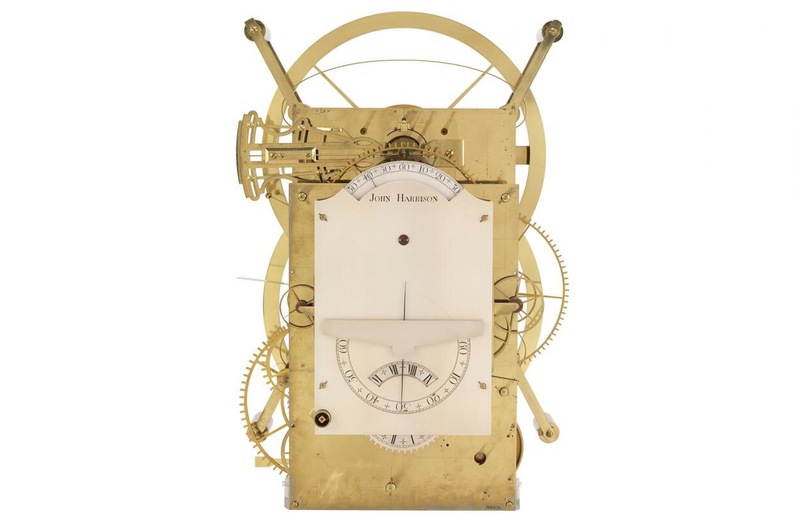 The book chronicles the various approaches of clockmaker John Harrison (1693-1776) and his eventual handmade solutions to the problem of determining one’s longitude at sea. In this post I’ll be talking about his clocks and what made them unique. John Harrison was not a prolific clockmaker. He is famous only for his five clocks that were made with the intention of telling very precise time during sea travel. They’re commonly called H-1, H-2, H-3, H-4, and H-5. Another noteworthy clock is K-1, an exact copy of H-4 made by watchmaker Larcum Kendall at the request of the Board of Longitude. In his early life Harrison also made a tower clock that provided the inspiration for some of his later work. It wasn’t until clock H-4 that Harrison considered himself successful, and strangely H-4 is a complete departure from his previous endeavors. I will be describing these clocks in the present tense because they are expertly preserved and are still wound daily and function perfectly today. An exception is H-4 which is not kept running for preservation reasons. H-1 is largely made of brass, like most clocks, with wooden wheels driving the time train. It weighs 75 lbs and was housed in a 4′ x 4’x 4’glazed case, though the case has since been lost. Harrison, with the help of his brother James, worked on it for five years before it was complete. It has four dials which each count a different meter – hours, minutes, seconds, and day of the month. After taking it out on a barge for testing, the brothers delivered it to the Royal Society in London in 1735 with the support of legendary London clockmaker George Graham. 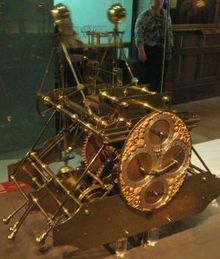 Harrison himself heavily critiqued the clock even though it met all the requirements of the Longitude Act of 1714, and he asked the Board of Longitude for a loan and two years to improve the design and make a smaller version. H-2 had a single dial upon which Harrison engraved, “Made for His Majesty George the IInd by Order of a Committee Held On 30th of June 1737”. It weighed 86 lbs, 11 lbs more than H-1, but was smaller in size. It featured improved performance under extreme temperatures and had an improved time train. The Royal Society, after putting H-2 through a number of tests, stated “that (as far as can be determined without making a voyage to sea) the motion is sufficiently regular and exact, for Finding the Longitude of a ship within the nearest limits proposed by Parliament and probably much nearer.” Harrison was unhappy with the device and requested more time to work on a third marine chronometer that would improve upon his first and second. For the next twenty years he lived and worked in London, occasionally requesting additional funding and purportedly doing nothing but working on H-3. One of H-3’s most significant differences from its predecessors is its use of balance wheels instead of bars. Additionally it is home to the first ever bi-metallic strip, still used in temperature devices today. In H-3 the bi-metallic strip is steel and sheet brass riveted together to expand uniformly when faced with temperature differentials. For H-3 Harrison also invented caged ball bearings, the importance of which to today’s society cannot be overstated. Harrison had mostly completed H-3 by 1757. In comparison, Conrad ball bearings were patented in 1903. To say Harrison was ahead of his time is calling a hurricane wet – the leaps forward in technology he created for the purposes of this one clock are like inventing the wheel, the cart, and taming a horse all for the purpose of getting to the next town over. Or in today’s lingo, like inventing the iPhone just because you want to play a handheld game about angry birds. H-3 weighed 60 lbs and was 2 feet high and 1 foot wide. Harrison considered it acceptable. It was in 1753 that Harrison was given reason to question his entire approach. 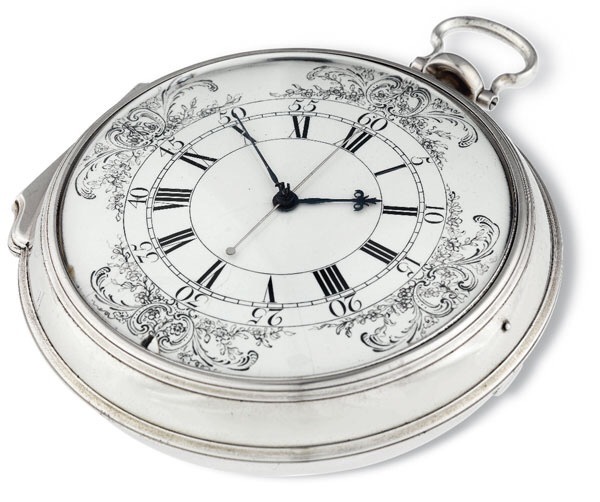 In collaboration with Harrison, watchmaker John Jeffrys made Harrison a personal pocket watch with a bi-metallic strip and the ability to keep running even while being wound. Harrison had always considered the size and weight of his marine chronometers to be significant problems. Impressed by the quality of Jeffrys’ pocket watch, Harrison’s focus shifted from frictionless, balanced clocks to a type of pocket watch that, while not frictionless, could potentially be accurate enough for long voyages. H-4 is shaped like a pocket watch, but is 5 inches in diameter. About H-4 Harrison said, “I think I may make bold to say, that there is neither any other Mechanical or Mathematical thing in the World that is more beautiful or curious in texture than this my watch or Timekeeper for the Longitude . . . and I heartily thank Almighty God that I have lived so long, as in some measure to complete it.” It was completed just two years after H-3, in 1759, and instead of springs and frictionless wheels, H-4 contains diamonds and rubies at points of potentially high stress in order to reduce friction. Around 1720 (39 years before H-4 would be completed) Harrison was hired to build a tower clock which he finished in 1722. Being originally a carpenter, he used a tropical hardwood that secretes its own grease, meaning that the clock has never once needed to be oiled. With the exception of a brief break in 1884 for refurbishment, it still runs perfectly today – 294 years later. For use in the tower clock he invented a new type of toothed gear combining the uses of various slow-growing and fast-growing woods to allow for the needs for lightweight versus strength in the gears. By 1770 Harrison had finished H-5, which was a slightly simpler version of H-4. He did so under the orders of the Board of Longitude, but appealed to King George III to remove the requirement that he make yet another copy (what would have been H-6). His advancing age and his extremely poor treatment by the Board of Longitude seem to have removed the joy of what was once his passion. 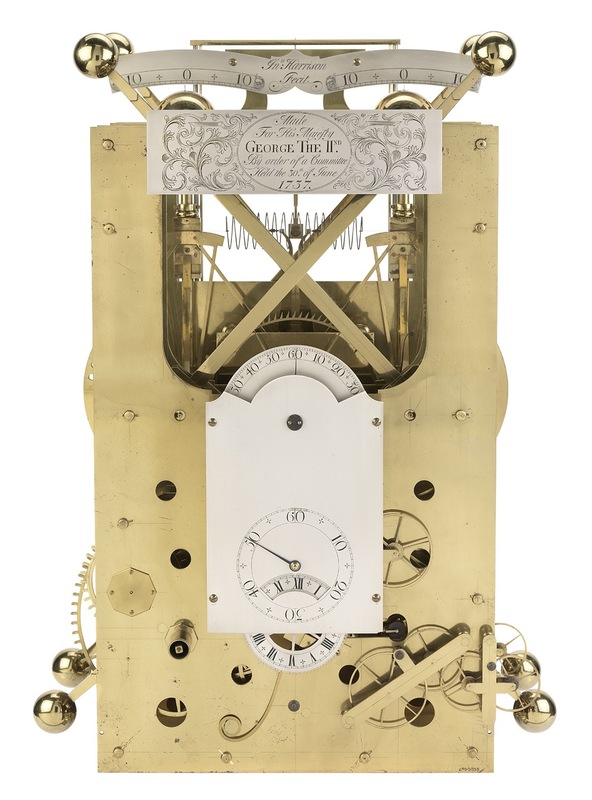 K-1 was made by renowned clockmaker Larcum Kendall at the behest of the Board of Longitude. He worked on it from approximately 1767 to 1770. The purpose of this work was to prove that H-4 could be replicated, and William Harrison, John Harrison’s son, vouched for its quality. Except for its abundance of flourishes on the case, it was an exact copy of H-4 using Harrison’s notes. The clocks described above were each the first of their kind. I hate to admit it, but before reading Longitude I had never heard of John Harrison. I expect the same is true of most people. I can’t personally write him into the annals of history, but I can admire and describe his clocks as I have tried to do above. Please comment below with any questions or comments about the book, him, or his clocks – even if the answers aren’t contained within the pages of Longitude I would very much enjoy unearthing them. Coming soon, a finale for Amelia Cuckoo and a long awaited Date Night with a local celebrity. As always I take requests for Date Night! If you want to learn about the history of your clock please shoot me a line, I’ll get in touch, and together we can solve the mysteries lost to time of who made it, when and where, what type of clock it is, and why it’s cool.